... is a guy that just started 2 miles down the road. ... is a chain that has not been lubed since 2004. ... is a guy with the biggest belly I have seen on a bicycle. For crying out loud finish your sentences! Anyone who has ever ridden a bike in some funky event ride, has heard these words. It is as if the rider sneaks up beside me, leans ever so slightly to their right, and without warning screams directly at me, "on your left". Why, I ask you, why is this necessary? Almost every time I go out to ride my bike, I try my darnedest to ride in a straight line. I am not swerving hither and thither. Even when I sing on my bike (which is embarrassingly often), I promise I ride a predictable path. My path is a straight and narrow one. These Event Cyclists who spread across the land screaming their mantra of "on your left" (it is never the good riders) scare the living daylights out of me when I am on a bike. I understand they may claim they are being "safe", but I would like to suggest using a perky "good morning" instead. They don't scream "on your left" in France, or Italy, or Switzerland. Switzerland is a very orderly place, they would appreciate safety, but nop, only here in America. Europeans love cycling and they love cyclists. All I have ever heard in France is bonjour, bonjour, bonjour. The one time people screamed at me while I was in France, I was riding my bike in the Etape du Tour and some very kind people were yelling "Allez Madame" from the side of the road. I appreciate that kind of yelling. I felt safe, and I believe I was riding in a straight line at the time (okay, except for the Col de Marie Blanque, I was swerving big time). 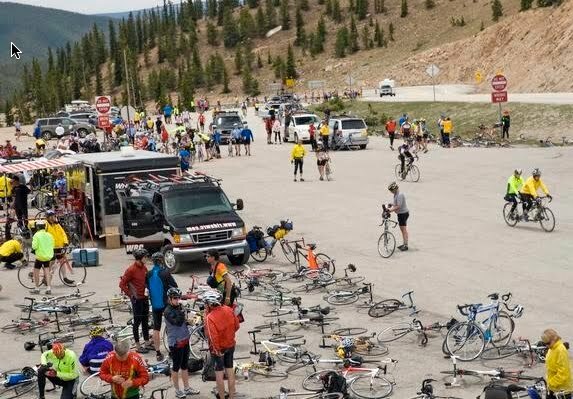 So here I sit, deciding which cycling events to participate in during 2010 near Colorado. My decision is based solely on where I believe I will run into fewer yellow jackets, or the Yellow Jacket Brigade as I call them. I cringe at the site of a yellow jacket (the official uniform of the event cyclist) because I am certain their first words will be "on your left," followed by, "where is the porta-potty?". I am now turning positive, although the riders sometimes scare me, I greatly appreciate the people who organize these events. I think it is awesome that they put water rest-stops every 10 miles. I also like that they try to keep the routes safe for participants, and I like the smiling faces of the volunteers who stand in the sun for 12 hours telling the Yellow Jacket Brigade to take their gloves off, after visiting the porta-potties, before digging into the freshly cut oranges. Alright, back to positive; I will admit I enjoy riding 80-120 miles on a bike. So what will it be this year? Copper Triangle - yes (a great ride), Deer Creek Challenge - yes (a new event), Santa Fe Century - maybe (lousy freeway ride at the end), Moab Century - maybe (great climb up the Big Nasty), Elephant Rock - yes. Or the latest craze of Centurions and Gran Fondos and Super Fondos - they could be interesting, they could be just hype. Triple Bypass - I'll be away (did it last year, super cool!). Ragbrai, Ride the Rockies, Bicycle Tour of Colorado - been there, done that (a week of porta-potties, what fun). Levi's Gran Fondo in California - I would love to do that ride (I am sure I could keep up with Levi!). A cyclosportive in France - now that would be challenging. Meanwhile I will be "on your right" riding up Deer Creek Canyon and High Grade Rd in my local area. Yesterday only 2 people passed me, and neither of them yelled, "on your left". Thank you, my wonderful calm fellow cyclists with great bike handling skills.